All Downers Grove events are held on the holiday, July 4, 2013. 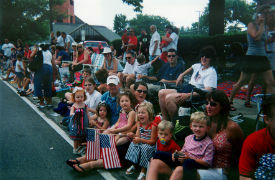 Spectators: The parade begins at 12:45 p.m. at Main St. and Grant St. and travels south on Main, ending at Warren Ave. Parade Grand Marshals will be the state champion Downers Grove South Boys Volleyball Team. Honor America's birthday with your friends and neighbors. Celebrate the occasion with a patriotic speech by Alexander Hamilton, as portrayed by Terry Lynch, after the downtown July 4th parade! Sponsored by the Village of Downers Grove and Village of Woodridge. The fireworks begin at approximately 9:30 p.m. at 75th St. and Lemont Rd.